English writer, actor, journalist, and director Stephen Fry has long been a favorite of mine. He’s tremendously smart and enormously witty, two things I aspire to be. Last year he released on his blog a podcast about language, its use, and the dour pedants who resist the continued evolution of language. The podcast is well worth a listen, but even more enjoyable is a six-minute animated video put together by one Matt Rogers. He takes portions of Fry’s podcast and uses kinetic typography to set it in motion, giving the words the beauty of dancers. Here it is for your enjoyment. 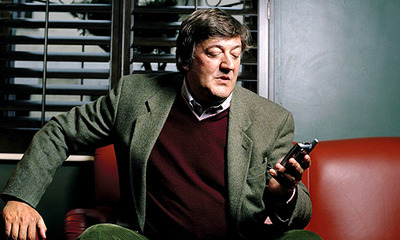 This entry was posted in Uncategorized and tagged Fry, language, Stephen Fry by christao408. Bookmark the permalink. I like him too. Best Oscar Wilde portrayal in my opinion! I’ll check out the podcast. Thanks! i like this. thanks for sharing. i think that with the marriage of technology and media, evolution in language comes at a speed that was once thought to be impossible. we are using new words by which to express ourselves and it will only continue as long as the spirit of creativity is allowed to froth from whatever corner of the media world it comes from. my thing is this though, and it has always been a problem with language. i take exception to the repeated mistake of not calling something for what it is. in that way, i believe that creativity becomes a bit of a haven for, laziness – in the least, ignorance – at worst. being able to disguise an old concept with a new word certainly has its benefits, but as we know, it also has its severe drawbacks. i think if there’s one thing that we need to watch out in regards to language, it is that. even though it’s not a new development in the sphere of man, it still has the power to undermine the great institutions that enable its free expression in the first place. but i’m going too much into this so forgive me. lol =) in the end, i agree that we can’t snarl dismissively at the spirit of language creation. it is, after all, the next best measure of man’s time here on earth and the most accurate. like all new things, it takes getting used to but i’ve no doubt that as long as we have people like stephen fry, who is willing to subject the “language guard” itself to personal audit, then we will come to some type of balance eventually and be the better for it. again, great post and thanks for sharing! I have enjoyed Fry in some roles and this is beautiful. I know I get accused of not making mistakes. My motto when teaching was say what you mean and mean what you say. Ah! I loved this one! Thanks for putting a rosy glow to the end of this work day!! I enjoyed the video a lot. The older generations who have studied the true English, reading King’s Grammar books and getting ‘knuckled’ for using foreign and slang words in their diction, would vouch for all the things that this gentleman is talking about. Many of the writers here on xanga, and that includes you Chris, are so perfect in the compostion of their posts. I truly enjoy their blogs, because I do not have to substitute the corrected sentence in my mind. The words flow beautifully and a joy to read.Thanks for posting this. @ThePrince – There is a fine line between calling something for what it is and interpreting something in a new light. That is what is interesting about the creative process. What spoke to me from Mr. Fry’s remarks is this idea that we can both guard against the misuse of language – “whose” versus “who’s” – as well as allow writers the freedom to stretch the language – turning verbs into nouns, for example. @CareyGLY – I’ve seen few other Wilde portrayals so have little to compare with, but he certainly did a fine job. @ZSA_MD – Very kind of you to say. I’m certainly guilty of writing posts that have their fair share of mistakes, but I write because I enjoy language and hope that that enjoyment is clear to readers. Along with my enjoyment of food, travel, and other passions like that, of course. @murisopsis – A rosy glow is a better end than a slow smolder! =D@yang1815 – @Fatcat723 – Glad you enjoyed it. @christao408 – i also liked the guy’s delivery. he seems supremely confident in the cadence of his thoughts going to his words. a special person, i would say. I wish I could ((HUG))you for that video!! I love it sooooo much. Being Dyslexic I try so hard to keep things straight. SIGH* This guy is my new hero! THANK YOU!!!! Recommending this!~!